This extruded foods helps prevent selective feeding, resulting in zero waste and has great palatability. A special production process, using high pressure and temperature, make the proteins easier to digest. Any harmful bacteria mould or viruses present in the raw materials are eliminated by the production process, rendering the food pure, clean and healthy. All lines contain Echinacea and Spirulina, both well recognised plant extracts, which boost the body's natural defences. All lines have a specially balanced vitamin and mineral composition to meet the specific animal's needs. Many of these minerals are chelated, which means they are coated with a protein layer to improve the uptake in the body to give maximum benefit. Fructo Oligo Saccharide encourages friendly microbes in the gut which help digestion. Mannan Oligo Saccharide prevents harmful bacteria from forming in the intestines or being absorbed onto the faeces and so avoids cross-infection of other animals. Yucca schidigera, this special extract from the yucca plant reduces faecal odour. Ideal for indoor pets. Vitamin E is added as a cell protection system. Vitamin E protects the body from the influence of free radicals and aging, prolonging the life of the pet. All Care+ lines have a specially balanced Omega 3/ Omega 6 fatty acid content to keep the animal's heart and blood vessels in optimal condition. The extrusions have a particular texture the removes plaque, and allow the teeth to wear naturally. This avoids expensive dental problems. 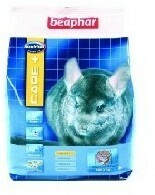 Chinchilla contains lots of fibre and almost no fat.